Posted on Wednesday, March 25th, 2015 at 12:28 pm. 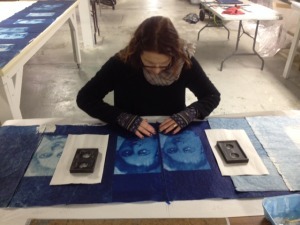 Workshops and tours, printing large scale, and book signings…..so great to have the energy and participants this winter. Denise Brady of Gibraltar Press brought by the new book publication she has done, with Karen’s woodcuts included. We signed the books before the launch party held in Omaha. 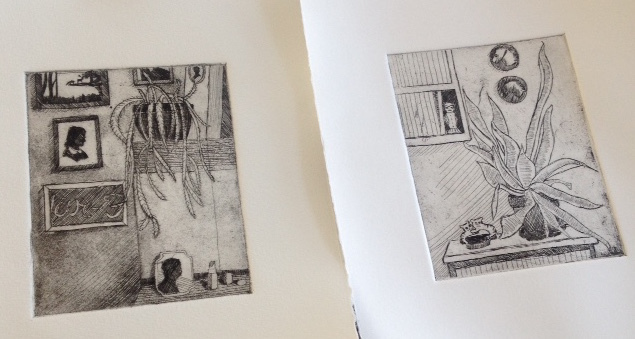 The etching workshop was successful for processing and developing of detailed images and beautiful lines. We tested how the studio functioned with the vertical tank set up….all very operational and efficient! UNL grad student Meryl Engler demonstrates her large multi-block color woodcut on the large etching press for the OLLI group studio tour. 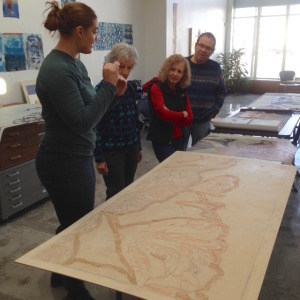 They are fascinated with all the processes and techniques of printmaking and have a thorough explanation now from the series of detailed demos. Posted on Wednesday, March 25th, 2015 at 12:09 pm. It has been great to host Artists in Residence this winter. 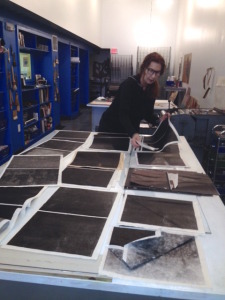 In February, Annaday Hiser enjoyed an intensely creative time, working on 4 book projects that she had been incubating for a number of years, using her cyanotype or photogravure images. We collaborated to bring printing, structures, and content together for beautifully rich and meaningful works. 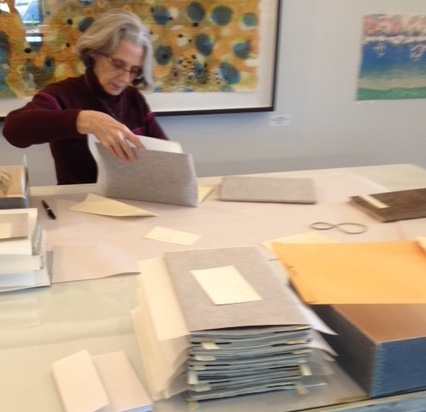 She printed woodblock pages, letterpress titles, glued sequences, sewn bindings, all on beautiful tactile papers. 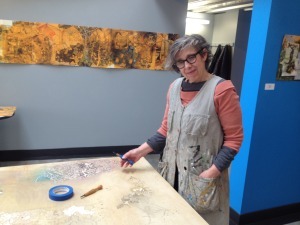 In March we are enjoying Ellen Wiener here in residence to expand her print vocabulary and considerable color sensibilities with woodcut and collagraph monoprinting. A rich tapestry surrounds us with her works in the current exhibition, as well as in the pattern influences that become layered densities, as the work and immersion evolves. These artists bring great conversations….and now a great reading list from their recommendations! Posted on Thursday, March 5th, 2015 at 10:20 pm. 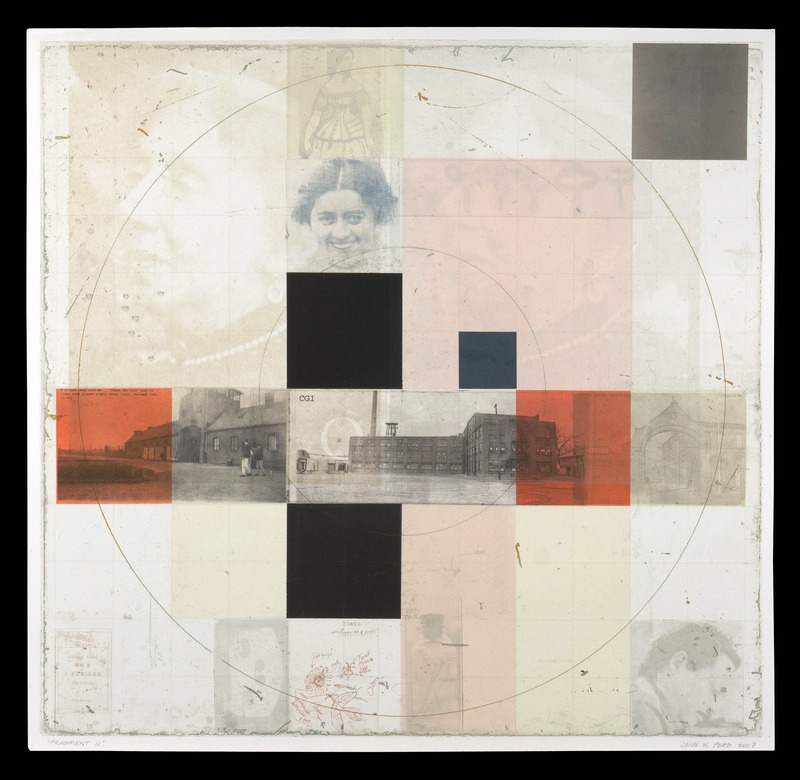 Constellation Studios presents an eclectic and beautiful collection of prints by nationally recognized artists who imply narrative incidents, a history and accident of printed marks, and play with illusion into and onto the printed stage or surface. This exhibition is curated by Karen Kunc and gives evidence of the vitality and reach of the print world today. Artists included are: John Ford, Debora Oden, Nick Ruth, Ellen Wiener. 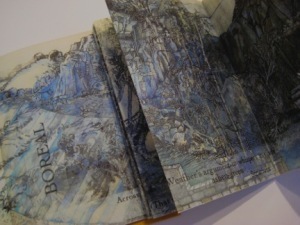 This new exhibition opens with a reception on Wednesday, March 11 from 7 – 9pm. The exhibition will extend through April 20. John Ford creates ethereal etchings of layered memory and immaterial sensibilities set into vague game board structures. Open spaces and inky atmospheres surround the sequences and repetitions of a forgotten memory and abandoned spaces. Ford is a professor at McMaster University, Hamilton, Canada. Ellen Wiener composes poetic narratives, panoramic in scale and dense with “thickets of hypnotic pen work”. She draws on the passage of time and references to sixteenth century engravings, navigational tools, literary percussive meter, all to describe transformative tales. 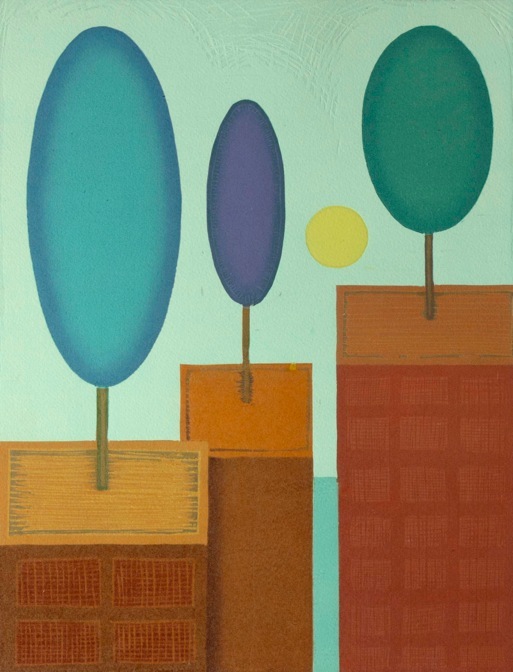 Wiener lives and works in Southold, New York, and most recently was a visiting artist at SUNY Stony Brook. Nick Ruth’s monoprints are radiant landscapes, full of pipes, holes and structures that are present in our complicated world. These anxious and funny depictions give evidence of our desires, and the absurd ways we humans try to control the worlds around us and within us. Ruth is a professor of art at Hobart and William Smith Colleges, Geneva, New York. Debora Oden has cultivated the chaos and risk of everyday life into a metaphoric voice. 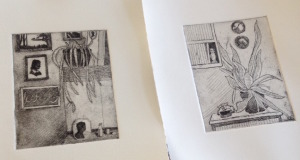 Her beautiful and raw etchings of marks and scratches are a dialogue between the process of living and that of making prints as a record of movement through place and over time. Oden is a professor of art at Savannah College of Art and Design, Georgia.